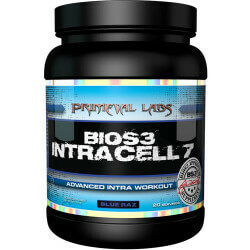 Primeval Labs launched their flagship Intra Workout product under the not so catchy name of BIOS3 IntraCell 7. BIOS3 is Jerry Ward’s brand and this product is a collaboration between him and Primeval Labs. So if you are still wondering what’s behind the name – BIOS3 (Jerry Ward) – IntraCell (The whole premise of this intra workout is to prime your cells for growth) – 7….well, did you guess it? 7 ingredients! Phew, OK, lets see what this baby is all about, because this is not your grandma Intra-Workout as you will soon see. 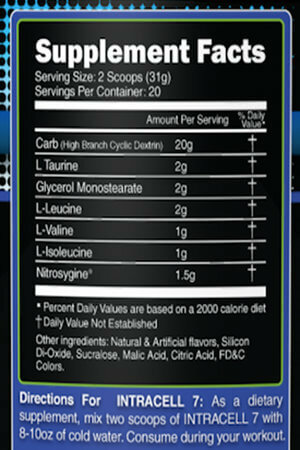 First thing, first, a serving size is 2 scoops – resulting in 20 servings of 31 grams. That is a lot of powder. Second thing, 20g of these come from HBCD (Cyclic Dextrin) which is one of the ‘new gen’ carbohydrate forms which is at the heart of what makes this product unique. 2g L-Taurine The highlight of the blend here is HBCD. A high quality ingredient and is great for both endurance and pumps. It is one of the better carb sources to use during workout, as it gives you the energy needed to have a more effective workout. 20g is a great dose for an intra. Taurine is a performance enhancer, boosting strength and muscle recovery. Though it failed to do so in a couple of studies, we still think it does its job pretty well. 2g is double the amount you might see in the average pre-workouts using this ingredient. 1.5g Nitrosigine GMS is the solid form of glycerin and is known to help in increasing pump effect during workout. With the ‘Mono’ Form it the yield is not that high compared to HydroMax. Nitrosigine is another great ingredient that is dosed well too. It has pump boosting effects and 1.5g is just at the top of the effective dose for it. Oh and to wrap all of these goodies you get 4g of BCAA in the 2:1:1 ratio. A tad below your 5g usual ratio. The Label’s Bottom Line- We like what we see here! BIOS3 Intracell 7 was designed for performance and it isn’t ashamed of it. The combination of the cyclic dextrin as a nutrient driver and performance enhancer together with the Glycerol and Nitrosygine is innovative, powerful and well thought of. The logic is – signal your muscles to synthesize protein (lucine / carbs), expand the vessels, draw water and nutrients to your muscles and shuttle carbs (energy) and all this without spiking insulin! Makes perfect sense! Best Flavors & Mixability – coming in 3 flavors: Blue Razz, Watermelon and Pineapple Mango. The Blue Razz is pretty damn sweet but that can be taken care of with some extra water. The Watermelon isn’t as sweet, but the taste still comes off strong. Same for the Pineapple Mango. We’d probably pick Watermelon as our favorite for this one. As for mixability, it mixes very well with the glycerol floating which you would expect. Another thing is it has dyes in it so after mixing it with water the color is very strong, maybe too much dye in this one. Effectiveness – Since this is an intra, we tried two methods. One was stacking it with a pre workout and one was using it by itself. We can truly say that it is fine by itself, with increased pumps as you would expect, but if you do use it you should totally stack it. The combination just makes it all the more effective. The best part of the experience was the endurance. It felt like you just keep going for days. The extra energy kick during your workout is very visible, this is one of these supplements you know is working! This is where the problems start. A 20 serving tub is going for $39.99, which feels expensive. That could really hold back this product’s success because this is a big of an investment for an intra. The quality of the product might justify it, but you’ll need to be able to afford it. Well, that’s why we are here, you can always compare prices for anything fitness before you buy and as you know, we are always on the hunt for the hottest deals from around the web on anything fitness. The BIOS3 is a a well thought of intra workout product, Primeval Labs didn’t save on the ingredients and IntraCell 7 delivers! It excels at helping you push through your workout with intensity. But a few things hold it back, first, we would love to see more hydration ingredients but mostly it is an expensive product. With that said, if you get see it on a deal that slashes the price per tub to the $25 range, then at that price we would say it is one of the best performance enhancers money can buy right now. See the hottest BCAA Deals from around the web!